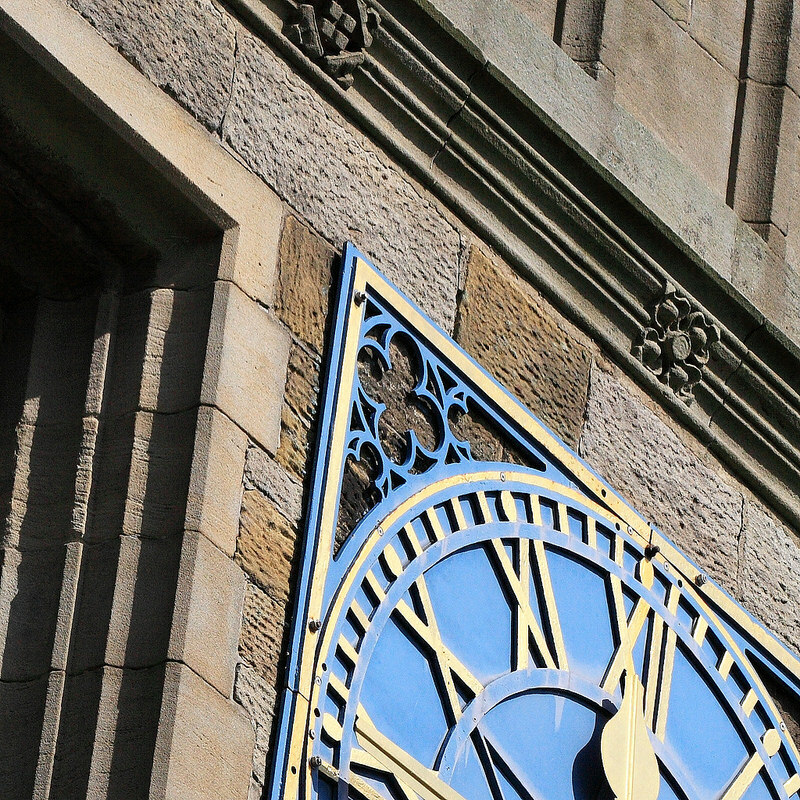 The agenda and papers for next week’s Full Council meeting are linked below. It will be a busy meeting, featuring presentations and feedback from Stanley Events on the Fireworks Display, an update from the STC Funded Advice Partnership which provides 5 day a week, face to face advice in Stanley and from County Durham Community Foundation in relation to a proposal to set up a new community fund for Stanley. There will also be a review of the town’s Remembrance Sunday events, proposals for the Civic Hall, Funding of local theatre groups and other business discussed. All of our meetings are open to the public and residents are welcome to attend and may ask questions relating to the business on the agenda. Please notify the Clerk in advance of the meeting if you wish to ask a question. The meeting will be held at 6.30pm in the Civic Hall. 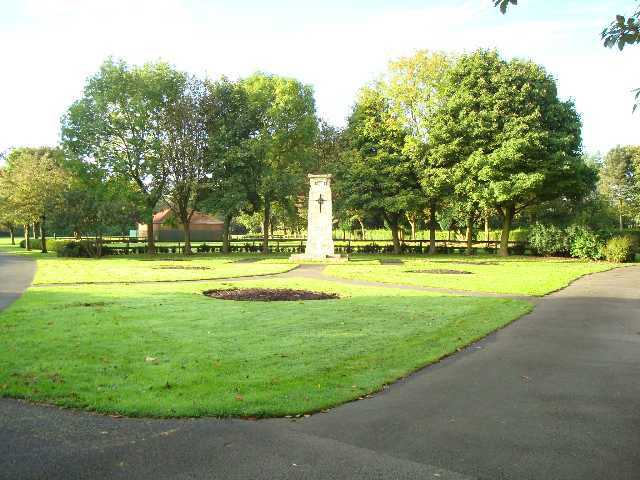 Two hundred and thirty three miners are named at the gates of South Moor’s First World War Memorial Park. Behind each name is a tragic story of loss and bereavement but perhaps none more so than that of Lance Corporal Peter Goggins who volunteered for Kitchener’s Army in 1915. Goggins, like many Durham miners of short stature was recruited to a ‘Bantam’ Battalion of the DLI as a specialist tunneller. Keen to leave the mines of South Moor he saw action at Ypres and the Somme winning promotion to Lance Corporal and marrying his South Moor sweetheart in 1916. Goggins fortunes would change on the 26th of November 1916. Isolated in a forward location as a German detachment advanced to over-run his trench his Sergeant ordered a withdrawal, jamming his rifle across the trench to slow the attack. Goggins left his position rapidly falling back. On re-joining his company he was immediately questioned, accused of desertion and jailed. Court martialled on Christmas Eve he was sentenced to be shot by firing squad, in spite of supporting evidence from his Sergeant. At dawn on the 16th January 1917 Private Peter Goggins was executed alongside 2 other DLI comrades. 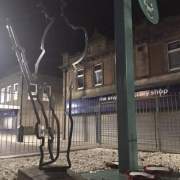 Now residents and visitors can walk round a South Moor and Quaking Houses First World War heritage trail that marks the homes and collieries of the fallen miners such as Goggins. The trail funded by the Heritage Lottery Fund, and Stanley Town Council links to a dedicated website www.southmoorheritage.org.uk hosting the individual stories of all two hundred and thirty three fallen miners and documents life in South Moor at the time of the First World War. Terry Deary’s latest book ‘Terrible Trenches’ uncovers the hidden horrors of the First World War. Relatives of miners named on the South Moor memorial, including Peter Goggins, are invited to attend the South Moor Park remembrance service at 10.45am on the11th November. 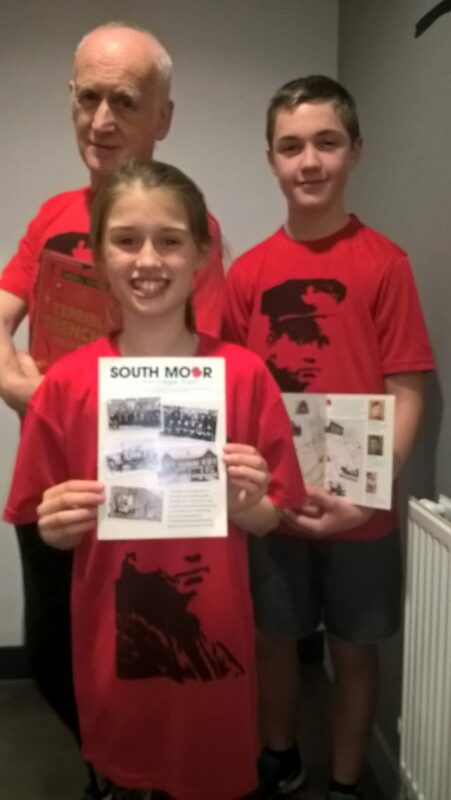 Organisers are also so keen to add the stories, photographs and letters of South Moor soldiers to the website contact Adrian Cantle-Jones project manager by emailAdrian.cantle-jones@durham.gov.uk or telephone 03000 265259. 1.45 Tesco Car Park meet up. 2pm Service at Annfield Plain Central Methodist Church. Also in Annfield Plain, ceremonies are held at the Memorial in the Avenue, Greencroft, at 11 am and at the Loud Bank Memorial, also at 11 am. 9.00am for service at St Margaret’s Church with wreath-laying. 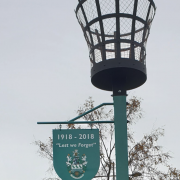 A BEACON of remembrance will be lit in Stanley on Armistice Day to remember those lost in World War I.
Stanley will be illuminated by a Beacon of Light – one of over 1,000 that will be ignited at 7pm on November 11, across Britain – as it falls silent to honour the millions who fought and died in the conflict, which ended 100 years ago. Stanley Town Council, which has funded the Beacon in Front Street, will light its brazier as the last post is played by a bugler. The service will also feature a dedication to the memory of Private Michael Heaviside, a Craghead pit hewer who was awarded the Victoria Cross for valour during the conflict. The 36 year-old soldier crawled 60 yards across No Man’s Land under heavy fire to bring water and first aid to a wounded soldier lying in a shell hole during the Battle of Arras, risking his life to bring him back to the trenches. On July 12, 1917, Stanley ground to a halt as locals afforded him a hero’s welcome. Days later, the Durham Light Infantry soldier was presented with his Victoria Cross by King George V.
Over 1,000 councils, communities and other organisations nationwide have confirmed their involvement by lighting WWI Beacons of Light. Everyone is invited to the Remembrance Sunday event, which will take place on Stanley Front Street (in front of the old board school) from 6:40pm on Sunday, November 11, 2018. 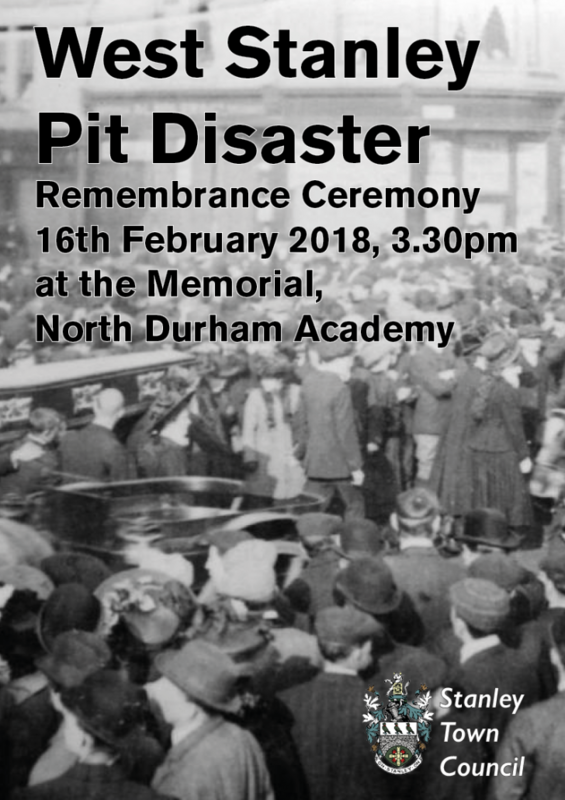 Stanley Town Council will be marking the 109th Anniversary of one of the darkest days in the town’s history where 168 men and boys lost their lives underground next Friday from 3.30pm at the Memorial outside NDA. All residents are invited to join us. This year the GMB are bringing the West Stanley colliery banner to the event and Craghead band will also be in attendance. 2pm Service at St Theresa’s Church. In addition to the events at the weekend, the Town Council will be holding a wreath laying event on Friday 10th November at the Civic Hall. All residents are invited to join us for 2 minutes silence. A regeneration project that captures the history of its residents has been completed in South Moor. Due to issues with flooding across the South Moor Terraces in Stanley, the Wear Rivers Trust, in partnership with the Heritage Lottery Fund, Stanley Town Council, Durham County Council, Groundwork North East and contractors Seymour Civil Engineering have installed a sustainable urban drainage system, a natural approach to managing drainage and recycling water. To do this, rain garden planters were fitted between the pavement, providing homes for five trees, each commemorating one year of fighting in the First World War. Along with additional foliage, the trees, positioned along the length of Pine Street, act as markers within the Twizell Heritage Trail, a route which tells the story of South Moor’s origins shortly before the First World War and how the miners shaped the community. Each tree will be marked with a World War one battle insignia, remembering the hundreds of miners who lost their lives. The project also saw the pathways fitted with block paving designed in the style of old fashioned film reel to commemorate the important role that local cinemas played in war time communications. During both World Wars, the community surrounding Stanley depended upon the five cinemas in the area for updates from the frontline. Adrian Cantle-Jones, the Durham County Council Project Manager, said: “South Moor residents are delighted with the wonderful improvements to Pine Street and the wider Twizzel Burn and South Moor Heritage Trail. The South Moor Partnership is looking forward to continuing the regeneration of the South Moor Terraces and Twizzel Burn Catchment”. 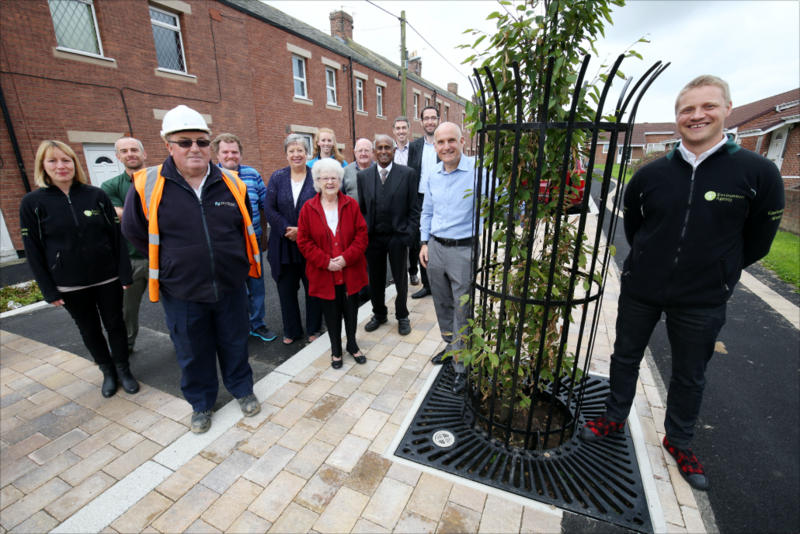 Keith Love from Seymour Civil Engineering, said: “As a company, we are really proud to have been a part of a project that has not only contributed to environmental improvement and flood alleviation, but has commemorated Stanley’s heritage. 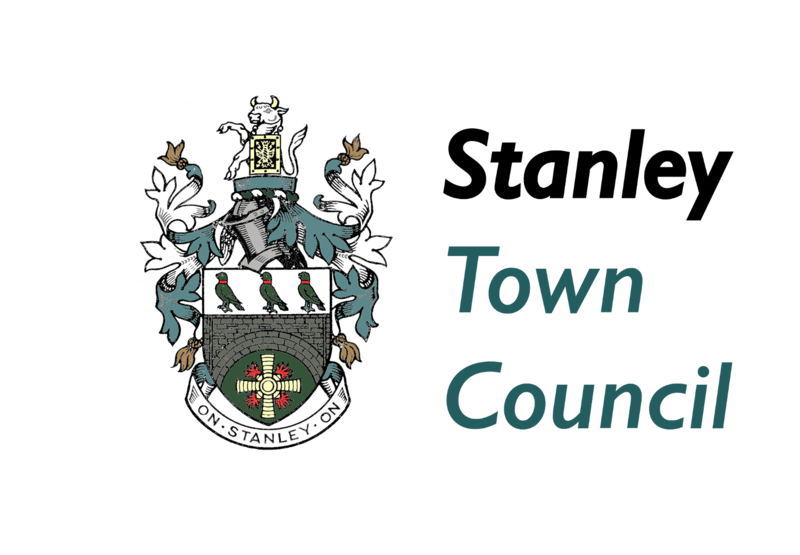 Stanley Town Council invested £60,000 in the Pine St scheme, the improvements in Memorial park including the new bridges in the woods and contributes to the maintenance of the heritage trail, keeping the path clear for people to enjoy. The final Full Council meeting of the current Council will be held next Tuesday at 6.30 pm at the Civic Hall. 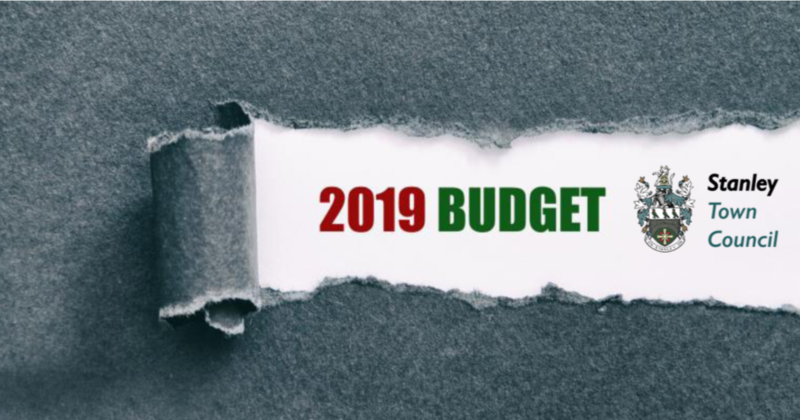 Business for discussion includes: Events, Heritage Funding, Civic Hall theatre improvements, Relocation of the Louisa Morrison Memorial from St Aidan’s Church, Council Offices update, New Member Training after the election. The public are welcome and encouraged to attend. The meeting will be streamed live on Facebook. 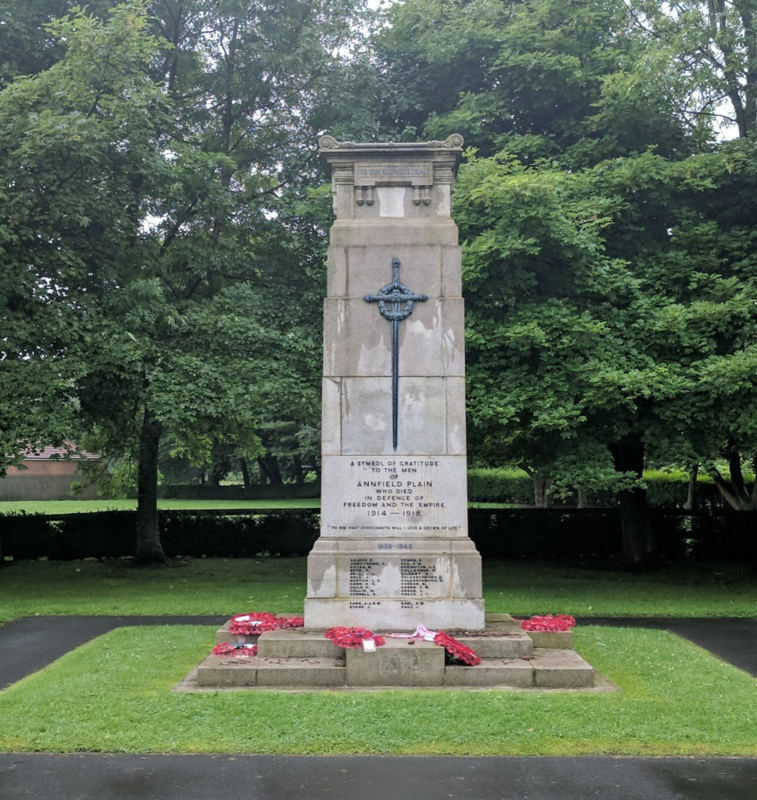 Council will be considering whether or not to become the custodian of Annfield Plain War Memorial, what a brand new war memorial for the whole of Stanley could look like, whether or not to provide a community defibrillator for the town and looking at budgets for next year at Tuesday’s meeting. We will also be considering a request for funding for a charity swimathon being organised at Stanley baths by the Rotary Club of Derwentside, the new ALDI proposal and proposed changes to Dog Control Orders across the County. The public are both welcomed and encouraged to come and participate in our meetings, this meeting will be held at the Stanley Education Centre (next to Shield Row School) at 6.30 pm on Tuesday 15th November. The hot chocolate from the free vending machine at Shield Row is recommended so we hope to see you there!